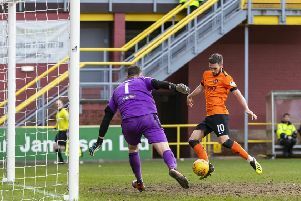 Butcher helped Robbie Neilson’s hopefuls scrape past bottom club Alloa 2-1 on Saturday thanks to Nicky Clark’s 87th- minute winner at tension-filled Tannadice. 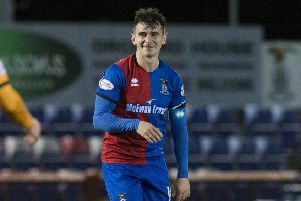 United are on a roll with back-to-back victories, having defeated leaders Ross County 1-0 a week ago, and now have a chance to cut the gap at the top to only two points when they head to East End Park to face Dunfermline tonight. Midfielder Butcher has his sights set on sealing automatic promotion back to the Premiership and insists he will happily sacrifice polished performances for precious points. Butcher said: “We will have to win ugly at times if we want to win the league. But winning ugly is the same as winning any other way. It’s all about getting three points. “We need to show character like we did on Tuesday and Saturday to get six points. We have seven games of the league campaign to go now and we will need to show the same mentality. “Saturday was a massive three points for us after the win over Ross County. It was huge for us as we knew we had to follow up with another big result. “Alloa are a tough team to break down. They have a good shape, and we knew we’d have to be patient. Stevie Crawford is convinced Dunfermline can pick up where they left off when they face United tonight. It is only ten days since the original meeting of the teams was postponed but much has changed in that time. Before the call-off, United were reeling from back-to-back defeats that had left them off the pace at the top, whilst Dunfermline had moved up to fourth. Now, United are five points off the top, and the Pars have slipped to fifth without playing due to Inverness’ victory over Partick Thistle on Friday. However, Crawford, left, is sticking to his mantra that the Fifers are concentrating all their efforts on catching the team above them in the table. With third-placed Ayr United visiting East End Park on Friday, the Pars boss acknowledges the importance of the coming days. He said: “It’s a big week for the club, but a good week and one we’ll look forward to.